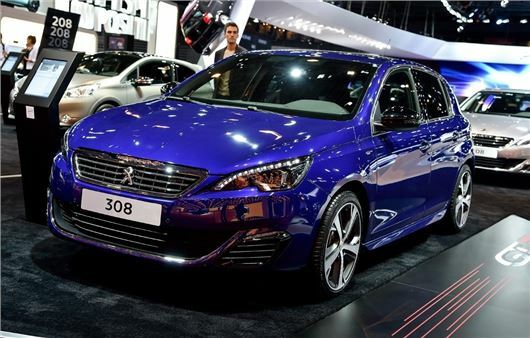 Peugeot has launched new high-performance GT versions of the 308 at the 2014 Paris Motor Show. GT models are offered in SW and hatchback body styles and get sportier styling, lower suspension and a choice of either a 205PS petrol or 180PS diesel engine. Expect to pay from around £25,000 when sales start in early 2015. Both the SW and hatch get GT-specific styling, including a new grille design and a repositioned lion badge, plus a rear diffuser, twin tail pipes and GT-specific alloy wheels. The cabin gets a red detailing and a red infotainment display theme. The diesel engine is a 180PS 2.0-litre BlueHDI, which produces 103g/km (107g/km for the SW) yet delivers an impressive peak torque figure of 400Nm. Fuel economy for the diesel is 70.6mpg in hatchback form. The petrol engine offered is a 1.6-litre THP with 205PS and 285Nm. Emissions for the petrol 130g/km and fuel economy is 50.4mpg (134g/km and 48.7mpg for the SW). Performance figures are yet to be announced. Peugeot has decided to blend dynamic and sporty handling with ride comfort instead of adopting an uncompromising high-performance set up with an uncomfortably firm ride. To that end the suspension has been revised and lowered by 7mm, while brakes have been improved for extra stopping power. The 308 GT will compete with the likes of the SEAT Leon FR range when it launches in 2015.